How to batch download HD drama, movie from BoxAsian with subtitle? Enjoy Asian drama and movies from BoxAsian offline by iPhone, iPad and any other smart phones, tablets or TVs. If you are on a trip and would like to watch Asian drama or movie, since there may not be reliable Wi-Fi connection, it will be convenient to enjoy local copies on your computer. BoxAsian is one of the sites where you can watch Asian drama or movie for free. How to download HD drama from BoxAsian? Is it possible to save the BoxAsian video with subtitle? Here we will show you a detailed guide on how to download online drama with the powerful BoxAsian Drama Downloader - Bigasoft Video Downloader Pro. 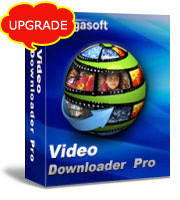 Firstly, free download and install the all-in-one Bigasoft Video Downloader Pro. There are two different versions for Windows and Mac users separately. Bigasoft tools are totally clean and safe. Batch download HD 1080p, 720p drama, movies from BoxAsian as well as Viki, DramaFever, KissAsian, YouTube, Myasiantv, Dramafire, Watch-episodes.tv, Tenplay.com.au, 9Jumpin, Dramanice, PBS.org and more. Save online drama to local disk on MP4, AVI, H.264, MKV, MOV, VOB or other formats for your player, like iTunes, Quicktime, VLC, Windows Media Player, etc. Extract or trim audio part of the drama from BoxAsian to MP3, AAC, AC3, M4A, WAV, WMA, etc. Download BoxAsian drama or movie for enjoying offline on iPad, iPhone, Android phone or other smart phones, tablets or TVs. Copy the URL of the BoxAsian which you want to download from the address box of your browser, then paste it to the text box on the left side of Paste URL button. Actually, as soon as you mouse over the download panel, the URL will be pasted automatically. Note: Multiple URLs can be pasted at the same time by clicking "for Multiple URLs" under URL box, so you can batch download more than one videos from boxasian.com. Click "Save Folder" button to choose the destination folder for the downloaded BoxAsian video. Bigasoft Video Downloader Pro will save the video from BoxAsian in its original format to keep the best quality. If you prefer to convert the downloaded video other formats, such as VOB for DVD, please click the small triangle to the right of the "Automatically Convert to", a drop down menu will pop up to let you choose your desired format. Click the "Download" button to start and finish downloading BoxAsian drama. After it is completed, open the destination folder to find the downloaded BoxAsian drama. Besides downloading drama from BoxAsian and similar sites, Bigasoft Video Downloader Pro also helps to save online video or audio from YouTube, Vimeo, Livestream, Metacafe, Facebook, Break, Veoh, Dailymotion, etc. Download and enjoy this wonderful Video Downloader Pro now.